It has become the custom of this blog to post, on this great Feast Day, two excerpts from the original account of the events of December 9-12, 1531, as dictated by Saint Juan Diego in the language of the Nahua peoples and recorded by an indigenous Mexican, Antonio Valeriano. These are Mary's words to Saint Juan Diego and to all of us, and they are an important complement to the singular icon that accompanies them. Three times I have been a pilgrim to the Villa de Guadalupe, in 1999, 2002, and 2003. I have spent hours upon hours in her company, and I know the truth of what she says in these words. 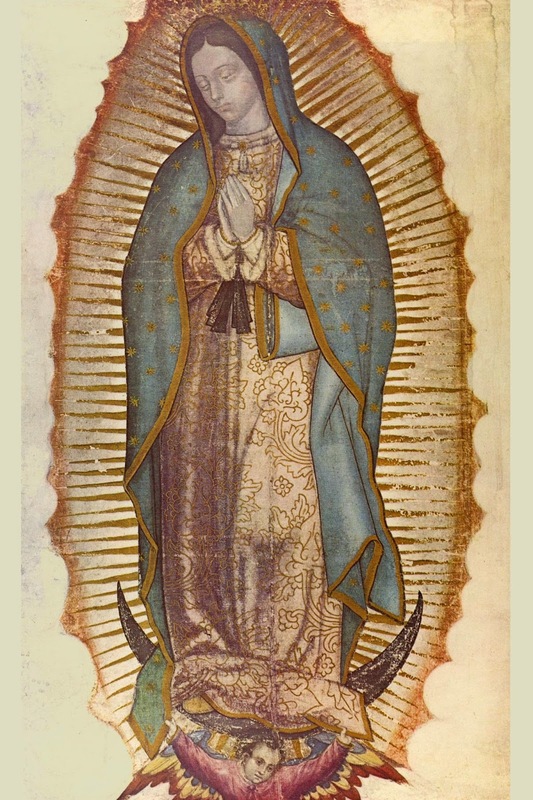 The icon of Our Lady of Guadalupe is not just a picture, and the greatest wonders that are worked through her are beyond all the observational and measuring techniques of the sciences. The testimony of science to the inexplicable nature of the image and its preservation are enough to impress us and gain our attention. But what matters above all is the dialogue that our Merciful Mother carries out with each of her children who seek her, cherish her, and bring to her their needs. Readers will no doubt find this version slightly different from other versions they may have read. The Guadalupe account is translated in various ways from various sources (usually from Spanish translations of the original). I am using here the translation of the late Father Martinus Cawley, O.C.S.O., a lifelong scholar of Nahuatl and native Mexican texts, above all the critical edition of Antonio Valeriano's original account, known as the Nican Mopohua. Father Cawley endeavored to render into English the poetic cadence of the text, which corresponds to the rich aesthetic quality of the image. To communicate herself and her Son, Mary entered a particular place, time, and culture. In the same way, she desires to dwell in a particular way with each one of us, in our families, our homes, and our communities. In her company, we always find her Son and our Brother, Jesus. And through her we learn how much Jesus wants to stay with us.